Our French bakery in Hammersmith is located in the Broadway Centre, opposite the Hammersmith District and Piccadilly line entrance/exit, next to Ben’s Cookies and Cards Galore. The Hammersmith & City and Circle Line station is just on the other side of the road, and the main Hammersmith Bus Station is also accessible from the Broadway Centre. 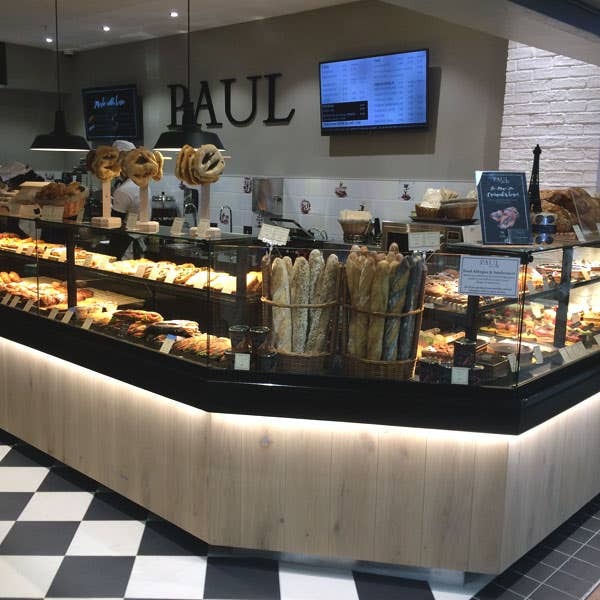 This convenient, central W6 location makes it the ideal place in Hammersmith to grab coffee, tea, hot chocolate, croissants, cakes, sandwiches, salads and freshly baked artisan bread. We are just a few minutes’ walk from the Hammersmith Apollo, the Lyric Theatre, Charing Cross Hospital, the Novotel London West and the numerous shops in King Street including the Kings Mall Shopping Centre. Also nearby is the Thames at Hammersmith with its pubs, rowing clubs and delightful riverside walks – also a great spot for watching the Boat Race. Nearest stations: Hammersith (District Line, Piccadilly Line, Hammersmith & City Line, Circle Line). Hammersmith Bus Station. Disabled access and free wi-fi available.